The company of "Sweat," written by Lynn Nottage and directed by Kate Whoriskey. 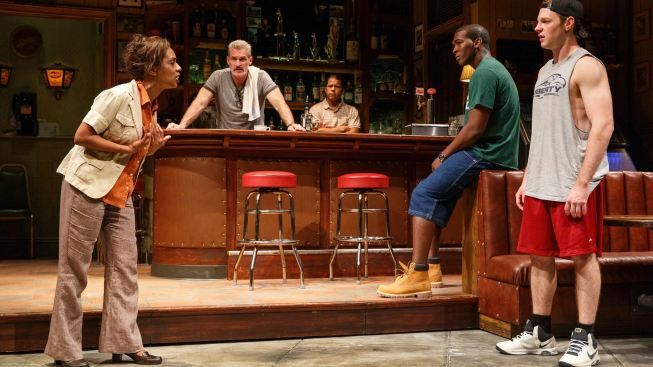 Hours after the Broadway revival of "Six Degrees of Separation" announced it was ending its limited run production early, Lynn Nottage's Pulitzer Prize-winning drama "Sweat" has announced it too is closing. The play, about factory workers in Reading, Pennsylvania battling the economic recession, will play its final performance at Studio 54 on June 25. At the time of its closing, "Sweat" will have played 24 preview and 105 regular performances on Broadway. Nominated for three 2017 Tony Awards including Best Play, "Sweat" went home from Sunday's honors empty-handed — therefore missing that box office-boost that often comes winners' ways in the wake of theater's biggest night. Directed by Kate Whoriskey, "Sweat" had a cast lead by Johanna Day and Michelle Wilson — who were both nominated for Best Performance by an Actress in a Featured Role in a Play for their roles. The production played a critically-acclaimed, sold-out Off-Broadway engagement at The Public Theater last year before it transferred to Broadway earlier this spring. Ticketholders who purchased seats to performances after closing should contact their point of purchase for refunds and exchanges. After Broadway, "Sweat" will go on a tiny-tour, of sorts. The show will be part of a site-specific multimedia installation in the town where it's set called "This Is Reading," which will blend the live performance with visual media. The special will take place at Reading's historic Franklin Street Railroad Station in Downtown Reading from July 14-16 and July 21-23.